The holiday period is just gathering steam, but we’re already past one of the biggest shopping weekends of the year (Black Friday, Small Business Saturday and Cyber Monday). We wanted to see how our users fared during the big shopping weekend and from the looks of things, it was a busy, busy weekend. In preparation for the Thanksgiving weekend, our users built more than 2,600 Campaigns (in just the last seven days). 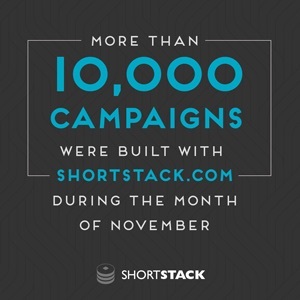 In addition, during the holiday weekend (Thursday-Monday) ShortStack users collected more than 830,000 leads (emails) from their marketing Campaigns. These numbers show the momentum businesses gather during the holidays — but do you know the biggest mistake businesses make during the holidays? Stopping their Campaigns after their holiday promotions are over! Wouldn’t the holidays be even better if you could keep the momentum of this past weekend going well into the New Year? The good news is you can keep building a bigger fan base and keep increasing your engagement and sales once the holidays are over — and you should! Most businesses see a lull in engagement after the New Year, but time and time again we discover companies that continue to see great numbers as long as they keep up their efforts past the holidays. Essentially, it’s time to throw the “one and done” theory out the window when it comes to your marketing Campaigns, and to come up with tactics that will keep your engagement and reach up, well into the new year. If you’re looking for ideas that will help you keep your holiday momentum going, I’ve got you covered. I’ll be the first to admit that a majority of people use ShortStack.com for promotions and contests. It’s the easiest and most effective way to collect emails and other valuable data from your online audience. However, not every action you take on social media has to result in a lead. Let’s not forget that social media was designed as a place to “socialize” with friends, colleagues and brands. It was never intended to be a selling tool. When you allow yourself to expand your marketing beyond promotions, you’ll open the door to a variety of Campaign options that you can run all year long. In fact, we know so many ways to run a Campaign that aren’t a promotion that we made an entire eBook out of it and have written several guest posts about it. January is the month for New Year’s resolutions. Most people have committed to do, or stop doing, something. But according to Forbes, only eight percent of people actually achieve their goals. And by the middle of February, most of those commitments are long forgotten. So why not encourage your fans to keep their New Year’s resolutions? Try running a Campaign where you ask your fans to submit their New Year’s resolutions. When people have an audience they have more accountability, so an essay contest can be a great place to host people’s resolutions. Do You Really Need to Make New Year’s Resolutions? The best way to keep your audience engaged after the holidays is to educate them! After all, a majority of users look to a brand’s social profiles to be further educated about that brand and the relevant industry. The new year is the perfect time to position yourself and your company as experts. Social media is an ideal platform for sharing content, so take what works for your audience and help them succeed in 2016. Don’t forget to use the 70/20/10 rule: 70 percent of your Page’s content shared should be information that is valuable and relevant to your fans; 20 percent of your posts should be shared content, i.e. content that comes from other people and the the final ten percent should be promotional posts. The promotional content can be sale announcements, new product alerts, events, etc. Don’t forget to share Facebook content across all of your networks. There’s no better way to keep the chatter going then to reflect back on the previous year. Offer up annual reports, infographics and success stories from 2016 that will excite your fan base and encourage them to move forward with you into 2017. If you had an awesome year on Twitter, let your fans know and share with them how you’ll meet your goals for 2016. Or maybe you focused a lot on Twitter and are looking to break into Facebook? Now’s the perfect time to transition your fans onto a new network. Graphical data from 2016 can be leveraged not only on social networks but through email marketing as well, which can drive new leads to your social profiles. Our favorite example of this is MailChimp’s Annual Report, even though it’s a few years old. Or, if you don’t have time to design a fancy annual report, you can do a simple recap. When one holiday ends, there’s always another one in the pipeline. We haven’t even gotten through the holiday season, and as soon as it ends we have to start thinking about Valentine’s Day. Valentine’s Day is all about the love, so brainstorm ways to show your fans how much you appreciate them. This could include a variety of photo, essay or video contests or simple “thank you” messages from you to your Fans. Social networks do not need to be all about business, never forget to sit back and simply thank your fans for being your fans. Show them the love! The worst thing you can do is accept the mindset “I ran my holiday promotion, now I’m done.” Do you only sell items during the holidays? Run ads during the holidays? Write on your blog during the holidays? The answer is most likely, no. If all of your other marketing strategies don’t stop, why should your campaigns? If you need help coming up with campaign ideas, we have a long list here, and are always more than happy to brainstorm with you if you email us at theteam@shortstacklab.com. This may sound crazy, but have you ever thought of waiting for your big Campaign push until after the holidays? That is what Star Olive did and they were able to increase their January website traffic by 288%. It should be noted that Star Olive runs Campaigns all year long, but they knew the holidays were a busy time of year for them, so they focused their efforts on beating the January lull. They created an engaging Campaign that showcased their products in a new light and got their audience thinking of their products all year long and not just during the holidays. If your business is one that already sees a great uptick during the holidays, consider pushing your promotion strategies back a few weeks and piggy-backing on the excitement of the holidays. There’s no question the holidays are a big time for brands. However, they’re not the only time! There are nine other months that marketers need to see success during. If you’re wondering how you can rack up a bigger budget for year-long Campaigns, here are some tips. Expanding your marketing beyond the holidays does not have to be expensive. The most important thing is to remain visible to your audience, whether it be with ongoing promotions or Campaigns that allow your audience to interact with you and your website.